This is a spin on a recipe from one of my mother's oldest friends. It was my favorite as a kid! At least three hours before baking, take the butter and cream cheese out of the fridge. They have to be at room temperature or your filling and frosting will get lumpy and grainy! Preheat oven to 350 and line muffin tins with paper cups. With an electric mixer, beat 1 egg, 1/3 cup of sugar, cream cheese, and 1/8 tsp. of salt. Fold in chocolate chips and set aside. Sift together flour, remaining sugar, cocoa, soda, and remaining salt. Add water, vanilla, oil, and vinegar and beat for two minutes with electric mixer. Spoon batter into cups until half full. Top with a heaping tsp. of filling. If you want larger cupcakes you can just fill them up! Bake for 30 minutes or until a toothpick inserted in the center comes out clean. *Note, the filling will create a cave-in on top of your cupcakes. Don't worry, it is normal! Now you can fill it with mousse. Beat butter, powdered sugar, and chocolate until blended, set aside. Beat heavy cream until stiff peaks form (or just use regular pre-whipped cream!). 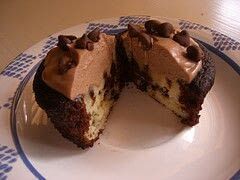 Fold together chocolate and cream and spread mousse onto the tops of cooled cakes. Sprinkle with extra mini chocolate chips. Bree, you add the water, vanilla, and vinegar mix to the dry ingredients that you sifted together in step 3. Enjoy! they were delish!! everyone loved them! I am seriously drooling right now! MMM! The butter is in the frosting. That's your last step of this recipe! These look great, but I don't see the butter in the recipe.. only in the ingredients?? Yummy, I have to try this But, one question. The bakeing temperature, is it Farenheit or Celsius? Hahha i love your tagline. THIS LOOKS AWESOME!!!!! !